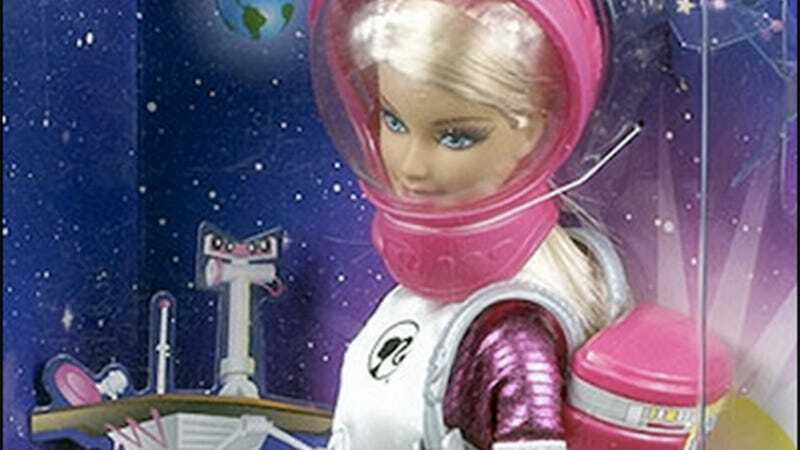 Why the hell did Mattel make NASA's astronaut Barbie pink? Good news, everyone—Mattel has made an astronaut Barbie! Anything that promotes this male-dominated job to girls is The Right Stuff. And it's sanctioned by NASA, too. The bad news: once again they have fallen into stereotyping by making the helmet and other parts of the suit pink. Was there any need for that? If there are no astronaut suits with pink elements, why make them pink? "Because girls like pink" is probably their weak non-argument. But still, that's a minor annoyance. If this small step for a doll ends with a woman taking a giant leap for all Humanity on the surface of Mars, we all can be happy about it.